After legal push-back from Paul Manafort, Roger Stone, and Jerome Corsi, all of whom have shown a reluctance to cooperate fully with the witch-hunt Special Counsel, (including an alleged attempt by Robert Mueller to get them to lie in order to implicate President Trump) Mueller has turned his abuse of power machinations against former Trump attorney Michael Cohen who was subjected to more than 70 hours of questioning by the Special Counsel, the results of which the Mueller team is now said to be actively leaking to favored media contacts. That doesn’t mean Mr. Mueller is completely satisfied, though. He was counting on more witnesses to corroborate what Cohen is now willing to admit/lie to in order to minimize his sentencing. That corroboration was to come in from Manafort, Stone, and Corsi. So far, that hasn’t happened even as abuse of power allegations are ramping up against Mueller. 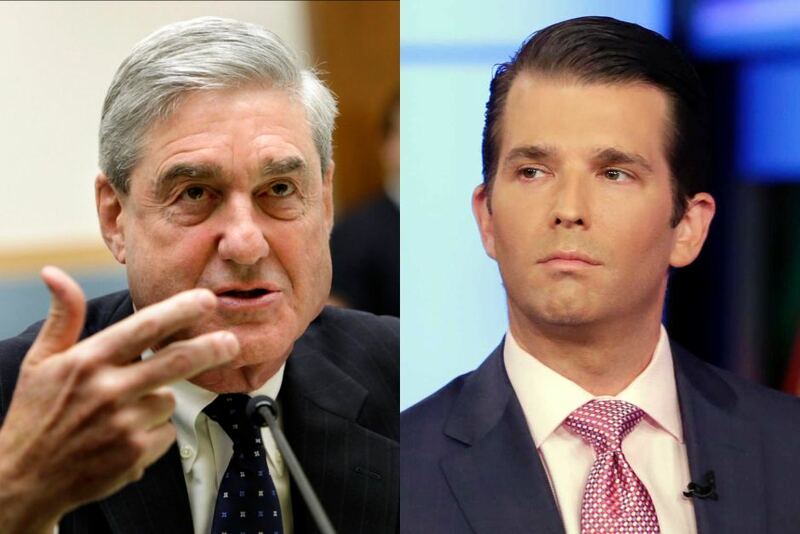 Whispers indicate it is Donald Trump Jr. who has been in the Special Counsel’s legal line of fire for the past several months and it is this soon-to-be aggressive implication that Mueller hopes will finally buckle the political knees of the president. It must be noted that to date that after nearly two years and tens of millions of dollars of investigations there has been zero evidence of any actual wrongdoing by President Trump or his family regarding allegations of Russia collusion. The Special Counsel operation is said to have become increasingly aggressive/volatile in recent weeks as a desperate Mueller works feverishly to organize something that resembles a competent investigation. That’s likely difficult given the entire premise of the investigation was flawed to begin with as it was based upon a ludicrous anti-Trump smear campaign bought and paid for by the Clinton machine and aided by the former Obama government. What’s missing is any corroboration and that is why Mueller is pushing down so hard on Manafort, Stone, and Corsi. He needs at least one of them to break and be willing to go along with the Mueller-Cohen created narrative and then likely use President Trump’s written responses to the Special Counsel to build a case against the president himself. Abuse of power. Intimidation. Leaks. Manipulations. Even outright lies—everything is being brought to bear against President Trump, his administration, and even his family. Special Counsel Robert Mueller has overseen a nearly two-year-long investigation that has cost tens of millions of dollars and has produced little to no proof of any actual collusion between the then Trump campaign and Russia. Instead, Mueller has filed silly charges against a handful of Russians who bought some Facebook ads, another charge against a secondary Trump campaign affiliate for lying to the FBI, and most notably, gone back a decade to file charges against short-term Trump campaign manager, Paul Manafort, on bank and tax fraud—none of which relates to the current Trump-Russia collusion investigation. It is the Manafort case that has since created growing whispers of abuse of power by Mr. Mueller as he is said to have become increasingly aggressive in trying to get people to lie in order to set the stage for a full on attack against President Trump. …Rudolph W. Giuliani, one of the president’s personal lawyers, acknowledged the arrangement on Tuesday and defended it as a source of valuable insights into the special counsel’s inquiry and where it was headed. Such information could help shape a legal defense strategy, and it also appeared to give Trump and his legal advisers ammunition in their public relations effort against the special counsel’s office. For example, Giuliani said, Manafort’s lawyer Kevin M. Downing told him that prosecutors hammered away at whether the president knew about the June 2016 Trump Tower meeting where Russians promised to deliver damaging information on Hillary Clinton to his eldest son, Donald Trump Jr. The president has long denied knowing about the meeting in advance. “He wants Manafort to incriminate Trump,” Giuliani declared of Mueller. …On Tuesday morning, Trump unleashed another blistering attack on Mueller, calling him a ‘‘conflicted prosecutor gone rogue’’ who is doing ‘‘TREMENDOUS damage’’ to the criminal justice system. ‘‘Wait until it comes out how horribly & viciously they are treating people, ruining lives for them refusing to lie,’’ Trump said. ‘‘Mueller is a conflicted prosecutor gone rogue. . . . The Fake News Media builds Bob Mueller up as a Saint, when in actuality he is the exact opposite. He is doing TREMENDOUS damage to our Criminal Justice System,” Trump tweeted. Yesterday’s reports of the Mueller investigation claiming Manafort had broken an earlier plea agreement was the direct result of Mueller learning of Manafort’s agreement with the Trump White House. Mr. Mueller is said to have been caught completely flat-footed by that discovery and panicked by the implication of his allegedly abusive/illegal tactics becoming public knowledge. How ironic would it be that when all is said and done it is Robert Mueller who faces a much more real criminal investigation? President Trump is now giving strong hints that might be exactly where this is all headed. It’s a move that has both New York and Washington D.C. buzzing. The defense team for Paul Manafort, after listening to federal prosecutors lay out their case against Mr. Manafort for reported banking and tax discrepancies dating back more than ten years, gave the court a collective shrug and moved to have the trial go straight to closing arguments without bothering to call a single defense witness. Though a potentially risky move, it is also a sign the defense believes federal prosecutors fell far short of presenting a case beyond a reasonable doubt – a form of laughing in the prosecution’s face. If the jury then returns a verdict of not guilty, it will be a serious embarrassment for the Mueller investigation which was clearly pinning its hopes on getting Manafort to provide something, anything, that Mueller could use to go after President Trump. 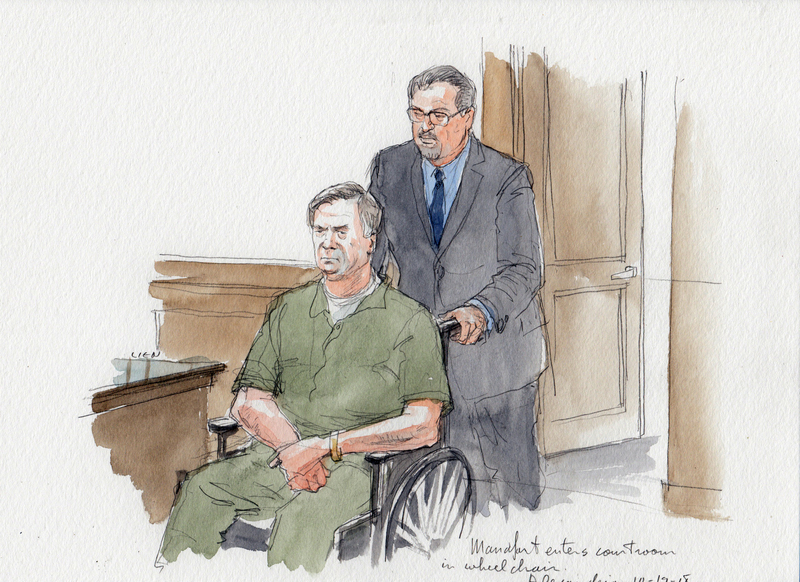 Rumors are also swirling that should the jury come back with a verdict of not guilty the Manafort team will move quickly to file a multitude of complaints against federal authorities, including Robert Mueller himself, over a number of alleged civil rights abuses. Such a move would certainly add significant fuel to the ongoing concerns that the entirety of the Mueller investigation has been a highly corrupt Deep State operation intended to damage or even overthrow, a duly elected President of the United States. The article is stunning for two reasons. The first is because few have managed to detail the many parts of the Deep State’s plot to defeat Donald Trump in a way that is easily understood as this week’s article does. Second, it comes from one of the nation’s most respected newspapers – the Boston Herald. Now consider this. Today, trial proceedings began for former Trump campaign manager, Paul Manafort, on charges brought up against him via the Mueller investigation/witch hunt regarding financial dealings from many years earlier wholly unrelated to Donald Trump or the Trump campaign. These financial dealings were actually investigated and found acceptable by the current head of the Mueller investigation and #2 at the DOJ, Rod Rosenstein, years earlier. (watch for that stunning truth to finally be brought to light by Manafort’s defense team very soon.) You see, Rosenstein already had the Manafort/Ukraine/Russia lobbying information on hand from that investigation years earlier. He simply handed it over to Mueller and directed Mueller to now use it to arrest Manafort and (they hope) get him to turn on Trump. In short, the entirety of the Mueller special counsel isn’t about finding a crime but creating one against President Trump and covering up one perpetrated by Hillary Clinton, Barack Obama, the Deep State, influential Establishment Media figures, etc. That is the only logical conclusion one can make after reading what the Boston Herald outlined above. Now it is up to YOU to share this truth with others. Buzzfeed, which was an essential component of the infamous fake news “Trump dossier” story is working double-time these days to further promote its anti-Trump agenda in what has become an increasingly clumsy and transparent case of media hackery. The FBI’s investigation of Donald Trump’s former campaign manager, Paul Manafort, includes a keen focus on a series of suspicious wire transfers in which offshore companies linked to Manafort moved more than $3 million all over the globe between 2012 and 2013. Buzzfeed goes on to include the words “Donald Trump’s former campaign manager” multiple times in the piece. What it downplays is that the $3 million dollar wire transfers predate Manafort’s role as a Trump campaign manager by several years. There is no evidence, NONE, ZERO, ZIP of any Russian collusion via Manafort during his brief stint as the Trump campaign manager. The Buzzfeed hackery is also further evidence that the CNN-generated story about “pending indictments” is likely yet another in a long line of nothingburgers. More than a few in D.C. are thinking the quickly released CNN leak regarding those indictments was a response by Mueller and company to push back against the far more stunning revelations that it was the Hillary Clinton campaign itself that paid for the false Trump dossier and then peddled that fake news story to a number of trusted media figures while at the same time the Obama White House was using it to initiate illegal surveillance of private citizens and try and use the power of the federal intelligence community to sway a presidential election. A few million dollars worth of wire transfers by Paul Manafort five or six years ago vs at least $9 million paid out by the Clinton campaign and the Obama FBI for the fake Trump dossier? If Mr. Manafort did in fact do something wrong he should be held accountable. Of course, shouldn’t the very same apply to Hillary Clinton, Bill Clinton, Barack Obama, John Podesta, etc.? The Obama IRS, notorious for putting its boot heels on the necks of political enemies for then-POTUS Obama is now, under the direction of Special Prosecutor Robert Mueller, doing the same to POTUS Trump. …These investigations, which are often extremely complex, can take a lot of time. That means the people involved sometimes have to spend significant amounts of money on legal fees. The Daily Beast previously reported that targets of Mueller’s probe—including Manafort—are facing financial strain because of the probe, and that Manafort recently parted ways with the law firm WilmerHale in part because of his financial troubles. Reports indicate Manafort is cracking under the financial strain Mueller’s witch hunt is putting on him. That is exactly what Mueller wants for it will make Manafort willing to say almost anything to make a deal. Whispers indicate that “anything” involves a critical member of the Trump family. An already ugly and abusive investigation is about to become more so.